Braitman and her husband Jude adopted a four-year-old Bernese Mountain Dog named Oliver, who was being rehomed through his breeder for reasons that they didn't ask enough questions about. Oliver proved to be a sweet, loving, friendly, devoted dog who suffered from serious insecurity and separation anxiety. The next few years grew increasingly difficult, as they struggled to help Oliver be more secure, and Braitman became interested not just in her own dog's problems, but the larger question of mental health and emotional balance in animals, domestic, wild, and captive, what that can teach us about human mental health. Braitman alternates an account of the history of the science of mental health, and how we have understood mental and emotional issues in both humans and animals, with accounts of the lives and issues of individual animals, and her own encounters with birds, apes, elephants, and cetaceans. Lovers of zoos, in which category I include Seaworld, will not find her discussion of them at all comforting. One key issue with zoos is that the keepers and trainers work closely and even intimately with the animals in their care, get to know them extremely well, and care deeply about their welfare--but aren't the people who make critical decisions about the animals' lives. This has, sometimes, tragic results. 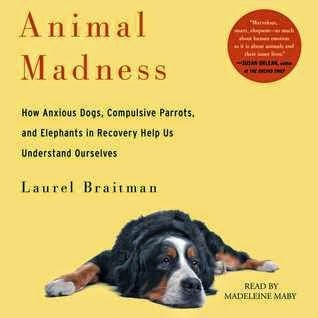 Braitman clearly feels strongly about the subject and about the animals whose stories she recounts, but she also has a fine critical eye and never becomes maudlin or over-emotional. If you have enjoyed the Seaworld show and had good feelings about it, you may feel very differently after Braitman's discussion of it. But you may also find yourself looking at your own dog differently, and find ways to have a happier and more fulfilled dog. I don't usually comment on the narrator, but in this case I found Madeleine Maby's narration seemed to capture Braitman's tone and expression, and enhance the experience of listening to the book.